After renting for seven years, Corrinna and Richard Moore found the house they had been waiting for. Prince Patrick House in Dalkey is a prime example of what imagination, hard work, courage, vision and immaculate financial timing can achieve. So lamented Corrinna Moore in 2006. They waited. And waited. And waited some more. In 2011, the market was at rock bottom and even the optimists had thrown in the towel. That’s when they pounced. If any couple is evidence of Warren Buffett’s immortal lines: “Be cautious when everyone is greedy and greedy when everyone is cautious”, it has to be the Moores, who subsequently transformed Prince Patrick House from a derelict skeleton of a former Victorian villa, to a stunning family home, with unbeatable views out over Dublin Bay to Howth. So derelict was their new home that a film company wanted the house for a zombie movie, but a venture into the Dalkey Gothic genre would have delayed renovation. The house, which had been empty for 25 years, was covered in graffiti, all the copper piping was long gone and, not surprisingly, the fireplaces and cornices had “changed hands” at various antique markets around the country. A master of understatement might refer to it as a “project” and Corrinna morphed from a renting mother of four into full-time project manager. Incredibly, by dint of strenuous work and ingenuity, Corrinna pulled off this feat in only 12 months. 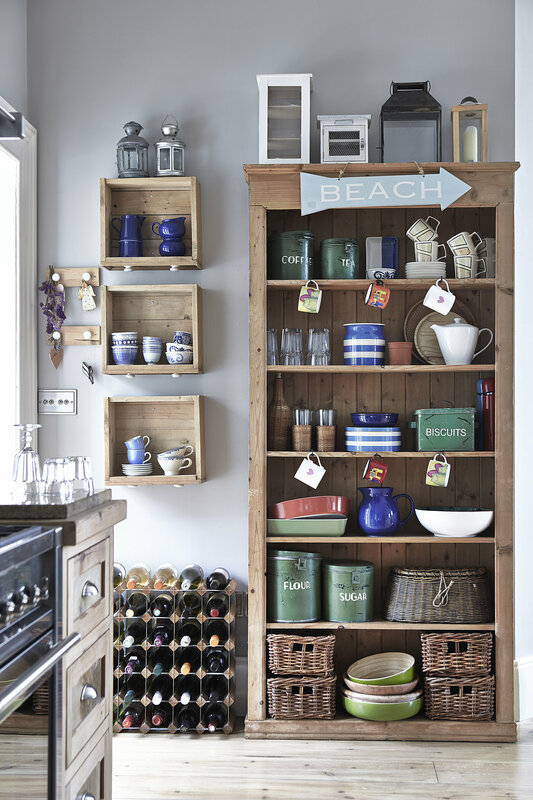 As project manager, she sourced everything – pitch pine for the kitchen, doors, paint, woodwork, tiles, baths, basins, ironmongery for the windows and doors, toggle light switches (which she loves) and even crackle glaze enamel door knobs. Those who know her suspect she didn’t sleep much that year. Her midnight hours were spent trawling the web for bargains, while her day involved many hours at the wheel as she drove around the country’s salvage yards, finding cast iron radiators, fireplaces, sanitary ware and old doors. She might have completed the house in record time, but no decisions were taken lightly. “Much to the annoyance of Richard and the builders, I agonised over every choice and worked painstakingly on every detail,” Corrinna admits. However, it has paid off in spades. What’s more, Corrinna is still on good terms with Myles Kavanagh and the subcontractors, who came back to turn the old coach house, which was hidden by a garden so overgrown that it hid the old stone walls, into a den for the children. Corrinna didn’t limit herself to choosing and buying the fixtures, fittings and furniture either. In a display of industriousness and parsimony, she painted the radiators and lots of the second hand furniture. She got down on her hands and knees to meticulously stain every single floor in the house with an oak-stain, thus achieving a beautifully soft shade throughout. With Richard away travelling for work quite a lot at this time, and with children in tow, it was an enormous undertaking. But she wasn’t entirely on her own. Turning to her mother, she found a source of inspiration. At the end of the phone, sometimes several times a day, Marie listened and advised. “As a homemaker with a terrific sense of colour, mum made all her own curtains, upholstered furniture and tended a garden, so she offered so much help and advice,” she says. Marie was also an avid auction fan, so lots of tips and counsel were administered over the phone as her dwindling budget necessitated ever more outrageous bargains.